Evacuees gather at Kodiak High School after an earthquake and tsunami alert in Kodiak, Alaska, Jan 23, 2018. A powerful undersea earthquake sent Alaskans fumbling for suitcases and racing to evacuation centers in the middle of the night after a cellphone alert warned a tsunami could hit communities along the state's southern coast and parts of British Columbia. The monster waves never materialized, but people who fled endured hours of tense waiting at shelters before they were cleared to return home. "This was a win as far as I could tell," said Marjie Veeder, clerk for the city of Unalaska, which is home to the international fishing port of Dutch Harbor in the Aleutian Islands. "We got advance warning and were so thankful for that." The magnitude 7.9 quake in the Gulf of Alaska triggered the jarring alert that roused people shortly after midnight Tuesday. Fleeing motorists clogged some highways in their rush to higher ground. Many took refuge at schools or other shelters. Even for Alaskans accustomed to tsunami threats and tsunami drills, the phone message was alarming. It read: "Emergency Alert. Tsunami danger on the coast. Go to high ground or move inland. Listen to local news." There were no reports of damage, not even on Kodiak Island, the closest land to the epicenter. Only after the all-clear was sounded did a little levity emerge. In Kodiak, a customer's Facebook post suggested a post-evacuation meal at King's Diner: "Hungry? Tsunami got you up early?" Eleanor King opened the diner at the usual time of 6 a.m. By the time customers started arriving, the excitement had passed and people just sat around quietly eating their meals, speaking little of the quake. The temblor reminded King of a deadly 1964 quake that generated tsunamis that killed 129 people and wreaked widespread devastation — events that remain vivid in the memories of many Alaskans. "It started out just like the big one," she said. "It was very slow and rolling, a good resemblance to the big one. That's what scared us." Tuesday's quake was recorded at 12:32 a.m. in the Pacific Ocean about 170 miles southeast of Kodiak, home to one of the nation's largest Coast Guard bases. It prompted the warning across thousands of miles of Alaska's southern coast, from Attu in the Aleutian Islands to Canada's border with Washington state. Kodiak is about 200 miles (321 kilometers) south of Anchorage, the state's largest city, which was not under a tsunami threat. Elsewhere in the United States, Washington state, Oregon, California and Hawaii were under tsunami watches, which eventually were lifted. Officials in Japan say there was no tsunami threat there. The state has an active tsunami-readiness program, and many communities have sirens and evacuation plans. In British Columbia, sirens blared and officials banged on doors to wake people from their sleep as a tsunami warning was issued along a large swath of the Canadian province's coastline. 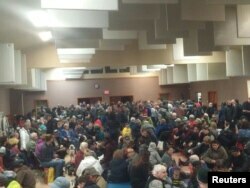 People are seen waiting at the Tofino Community Hall during a tsunami warning, in British Columbia, Canada, Jan. 23, 2018, in this image obtained from social media. "I just heard the firetrucks going around, honking their horns and on the loud speaker saying there is a tsunami warning," said Gillian Der, a University of British Columbia geography student who is studying on Haida Gwaii, off the coast of British Columbia. "It was very apocalyptic." Chris Alemany, who lives in the Vancouver Island community of Port Alberni, Canada, said he was sleeping soundly with earplugs when his 10-year-old son barged into his bedroom and woke him up. Alemany had not heard the sirens, even though they are a block and a half from his home. When he took out his earplugs, the noise was "really, really loud," and it became clear quickly they needed to evacuate, he said. The family decided to flee to Alemany's parents' home. They had to decide on the fly whether to take their dog and three cats. They didn't, in spite of their son's protestations. "I've never seen so much traffic on our roads," he said. "At 3:30 in the morning, it was like there were 4,000 extra people in town or something because everybody was headed up the street." The time between the siren sounding and the all-clear was tense, and his son and daughter were scared. "But in the main, I think people kind of knew what they needed to do and just waited for information," he said. Back in Alaska, people reported on social media that the quake was felt hundreds of miles away, in Anchorage. Reports varied about how long the quake's shaking lasted, depending on location. In the popular cruise-ship town of Seward, about 110 miles (177 kilometers) south of Anchorage, Fire Chief Eddie Athey said the quake felt like a gentle rattle that lasted for up to 90 seconds. "It went on long enough that you start thinking to yourself, 'Boy, I hope this stops soon because it's just getting worse,"' Athey said. The Alaska Earthquake Information Center categorized the shaking as light. The quake was a type that usually produces less vertical motion, which means less chance for waves to build for a tsunami, said Paul Earle, a seismologist with the U.S. Geological Survey. That was somewhat unusual, because quakes in the area usually are a type that cause more vertical motion and increase the chance for a tsunami, he said. The quake was the planet's strongest since an 8.2 magnitude in Mexico in September. Kodiak resident Ted Panamarioff survived the 1964 earthquake, which was magnitude 9.2. But his father died in the ensuing tsunami, he said. To him, Tuesday's quake felt far milder, although it did wake him up. He was never worried about killer waves. His home, he said, is too far inland. "If anything happened, if there was a tsunami, it'd have to be one hell of a big tsunami to get me where I'm at," he said. "And then there wouldn't be a city left."